You are here: Home » A101 News » Meet our Sales & Marketing Intern, Corey! Meet our Sales & Marketing Intern, Corey! This week the Abroad101 team welcomed Corey as a new team member! 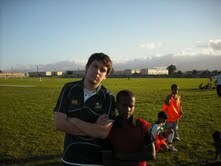 Corey studied abroad in South Africa and writes about his experiences below. Welcome, Corey! Now, you may be asking yourself, WHAT DID HE JUST SAY?! Let me explain. ‘Mollo’ means ‘Hello’ in Xhosa, one of South Africa’s 11 national languages. I traveled there for my own study abroad experience in 2009 and was forever changed! I’ll get to that story in a minute, but first let me officially introduce myself! I’m Corey Smith, the latest addition to Abroad101’s already stacked crew of study abroad dynamos! I just finished my first year of graduate school at American University in Washington, D.C., a real hub of international affairs. I’m pursuing a degree in International Media and am learning how to apply the technical prowess and communication skills of a journalist to the realm of international education and study abroad – it’s been quite a journey to say the least! Let me just say that I never expected to study abroad, especially to South Africa. However, when my Honors Program Director told me I’d be hopping on a plane to complete a project for my class, I suddenly found myself in a whirlwind of excitement and fear. I had never been abroad before (sans a weekend trip to Montreal, Canada), but boy was I missing out! Somewhere between climbing to the top of Table Mountain at sunset, getting carjacked by a troupe of baboons and playing futbol with a bunch of children in the townships, I found out that I loved learning about and experiencing other cultures. I promptly returned to my undergraduate school and began taking classes that provided an international perspective to my already solid journalism background. Upon graduating I worked at Road Scholar, an international education organization that sends older adults on short-term programs in over 90 countries. I had the rare opportunity to contribute to program planning for places like Bhutan, Cuba and multi-country ship voyages. However, I was soon taken in another direction as I went to DC to begin school yet again and work for The Alliance for Global Education, a study abroad provider keenly focused on Asia! I was even influenced enough by them to plan my next trip to South Korea! So now here I am, insanely excited to begin working to get everyone hooked on using Abroad101’s evaluation and assessment tool! This is going to be a great opportunity for me to flex my communication and media skills while tapping into all the knowledge I’ve gained working and being involved in the international education field. Expect many blog posts from me because I am something of a social media nerd (follow me on Twitter for lots of international education, communication and media stuff – @coreyallansmith)! It’s great to be here – and a big enkosi khakulu to Abroad101! That means ‘Thank You’ in Xhosa, by the way! Marathons Around The World? Yes!